Can we work out what ingredients could make "free will" work? Here's a map of some of the steps it would need. 1. How could free will work? Can we map some steps it would need? 2. Neither sense of “free,” as unconstrained or costless, applies. It’s always constrained (e.g., by physics), and always incurs costs. 3. Calling it “choice” better frames matters. Since nothing in physics chooses (all interactions = fully determined = determinism), how can anything seem to choose? 4. Consider the hillside illustrated above. An arrangement of atoms forming a bowling ball rolling to the intersection must continue downhill, it can’t climb that second path. 5. But some compositions of atoms can climb that second path. A balled-up armadillo (they do that) rolling to the intersection, can unroll itself, turn and scamper upward. 6. To achieve that, what must an aggregate of atoms be able to do? To resist, but not break, the regime of physics? 7. At least three things: store energy and use it to decide and to act (= information handling + working against gradients). 8. Without those three capabilities, a combination of atoms is locked into rolling down the physics gradients. 9. Such atom combinations needn’t be alive—robots, like a BB-8 motorized ball, which rolls under software control, can spend stored energy on gravity-countering, to follow the armadillo. 10. Mapping such steps might suggest why there’s no “choice” in lower level physics. Only complex, intricately structured aggregates can logically ever exhibit “choice.” Nothing simpler could. 11. There’s no mystery in inanimate matter “choosing,” software routinely does that trick. 12. Centuries of “free will” debate (atoms swerved to “snap the bonds of fate”~60 BC) yield three current groupings, which Massimo Pigliucci summarizes here (+ detailed, + charted). 13. “Incompatibilism”: Choice is an illusion. “Compatibilism”: Choice co-exists with determinism. 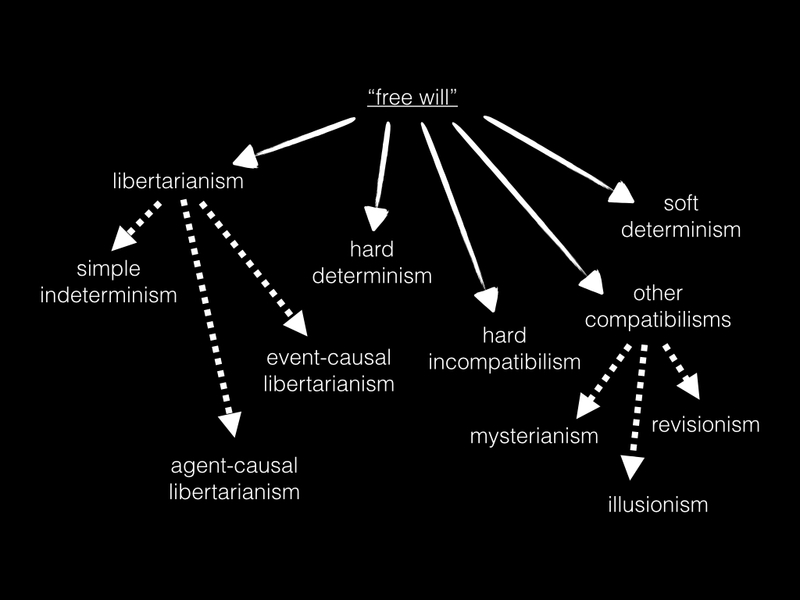 “Libertarianism”: Choice exists, but defies determinism, mysteriously (=hardest choice for scientists). 14. Examples of incompatibilist scientists include physicist Sabine Hossenfelder and evolutionary biologist Jerry Coyne. 15. Note, evolution entails capabilities not visible in physics (takes information-storing, replicating, varying aggregates). 16. State-of-the-art compatibilism is wonderfully described in Sean Carroll’s The Big Picture: one all-material reality needs different vocabularies for phenomena that emerge at different levels (”poetic naturalism”). 17. Emergence is crucial here. Its logic, long known to philosophers (how the properties of parts and wholes interrelate + related fallacies of composition, and division) doesn’t seem as well known to scientists. 18. Can we project the properties of determined interactions among particles onto everything that’s composed of particles? That’s like extrapolating from a few transistors to what 7 billion combined on a chip can do. 19. And fully determined interactions ≠ predictability. Wolfram Rule 30 shows simple deterministic interaction logic causing unpredictable patterns. 20. Choice-making is basic to life (bacteria choose). Physics hasn’t needed a language to handle choice. But life’s atom-compositions, by doing branching if-logic, generate richer patterns of past-to-future relationships. 21. This perspective is far from complete, but choice always has energetic costs (for deciding and gradient-climbing). 22. Libertarianism posits “supernatural” factors, but incompatibilism risks a subnatural or sub-empirical path (discounting observable choice-generated patterns). Let’s energetically free ourselves from such mind-limiting paths.